Just trying to be accurate is all. Even if it's not half the catalog, 550 previous-gen games is still very impressive. I think the main thing that's slowing them down is licensing. Looking at the list of 360 games and looking at what's not BC yet, a good number of them seem like they may have licensing issues. To be fair, you get diminishing returns now. Most of big titles are bc now, so they aren't going to waste time on games that sold 12 copies. Probably more like 12,000, but yeah, a lot of the big name titles have been released. All of Assassin's Creed, most of Call of Duty, half of Battlefield, most of Halo, etc. Enslaved still not BC, correct? A few years ago I posted something about not seeing the point in BC. Only improvement to digital content I can think of now is some sort of resale or trade in program. It's unlikely there's an unsurmountable technical challenge with it (since they can give stuff away or revoke it in GWG), so it's a business decision. Not everything is on BC, but there's a ton of stuff. For a new console owner, if they got a Gold sub for the GWG and a Game Pass sub, that might not be "enough", but that would be a whole lot of gaming. I've played some on GP that I couldn't download fast enough, but I've also discovered some games I've enjoyed a lot. I wish Mutant Year Zero was not quite so hard though. I'm not great at the stealth parts but unless you pick off a couple of the baddies before the combat, the combat is tough. I like the world and the player characters though. There's a deal on Game Pass, 6 months for half price, on the dashboard. Anyone know if it stacks/extends current sub? ..they aren't going to waste time on games that sold 12 copies. I actually don't think this is a factor. Over the release period, there were several surprising titles made BC, in that they had relatively tiny sales and got releases before some of the huge titles that have since come along. Spencer's stated goal is to have everything BC, within reason, and the continued support we're talking about makes me believe he's speaking in good faith. At this point, I think the biggest obstacles to any game in question getting a release are publisher permission and licensing issues (delisting potential). As has been mentioned previously regarding BC, a lot of titles get included because they utilize the same core engine as some of the bigger titles. This allows a lot of those to be automatically supported, technically, or at worst very minor tweaks to deal with unique challenges. Agreed on all of the above. I mean, it's still an attempt to make money by selling copies to new customers, which is fine, but the more titles they have on BC, the more they can do with that in the future (bundles, adding to Game Pass or GWG, etc.) without making current owners of games re-buy them if/when their older hardware breaks down. Also, regarding smaller titles, I'm genuinely surprised at some that have made it to BC. That that dumb Dorito Dash game where your avatar competes against others... and Boom Boom Rocket, a rhythm game that uses techno versions of old classical songs with cityscapes as the background. I played the hell out of that dumb game on 360, but I assumed I was one of a handful. It was like $5 (or 400 points, remember those?) at the time it came out. I would think Phil Spencer and his team are smart enough to have, at bare minimum, explored this kind of expansion to the BC program, even if the rights-owners are completely unwilling to do it. One thing that would be really awesome is if they were somehow able to work out a deal to expand the BC to other legacy disc-based platforms. Sega Saturn? Dreamcast? 3DO? Sign me up! There's not really any incentive to MS to make the discs from these consoles playable on the Xbox, since MS never received any money from these purchases. Also, in terms of Sega consoles, Sega's been pretty aggressive porting their own content to new consoles. There's even a "Dreamcast Collection" of 4 games for 360 that is BC on the One. Now digital BC does bring in some additional revenue, but BC for discs is all about brand loyalty. The message they're pushing is "you buy on Xbox, you can play it on Xbox, forever." Even then, they seem to be much slower and more selective with the original Xbox titles they're adding. Licensing becomes much trickier the older the title is, and there's likely diminishing returns in terms of revenue from new sales of older games. They seem to be focusing on titles they can "enhance" of the original Xbox catalog. Also, the major console manufacturers seem really wary of emulating each other. Microsoft is possibly the most aggressive, since via Rare they've emulated the NES and N64 in Rare Replay. When I started playing Tetris Effect a couple weeks ago, my wife asked, "Isn't this like that fireworks game you used to play all the damn time?" You're totally right... I just meant it would be nice if they could expand that mission to dead consoles that aren't owned by Sony or Nintendo. Obviously, there's no financial incentive other than a minuscule amount of digital sales at best... but if, for example, those BC games were included in Game Pass or something like that, it might get more people to sign up. Pipe dreams, to be sure... I know it'd never happen. I just wish it would. so why is Enslaved not bc yet? the developers? Nobody knows dude. We're just average consumers, like you. Nobody here has the "inside scoop" on anything relating to BC. However, the publisher, Namco Bandai, has other games on BC, so they seem up for licensing titles for BC. So there's nothing obvious that would be stopping it from eventually coming. But the short answer to all "why isn't 'X' BC yet" questions is that MS can only release so many game on BC in a given timeframe, and they chose to release other games so far, based on a variety of factors, mostly unknown to the general public. There's plenty of other games that people would like to see on BC, and Microsoft and publishers/developers would like to put on there as well, but they have to wait in line. I really want to like this one... But I'm just not digging the actual gameplay. I think it's specifically the crafting and survival stuff that's ruining it for me. I don't like games where you have to remember to feed your character ona regular basis. I also made the mistake of feeding him some innards and... he threw up for like 5 minutes. I might stick with it a bit longer... But I don't know. 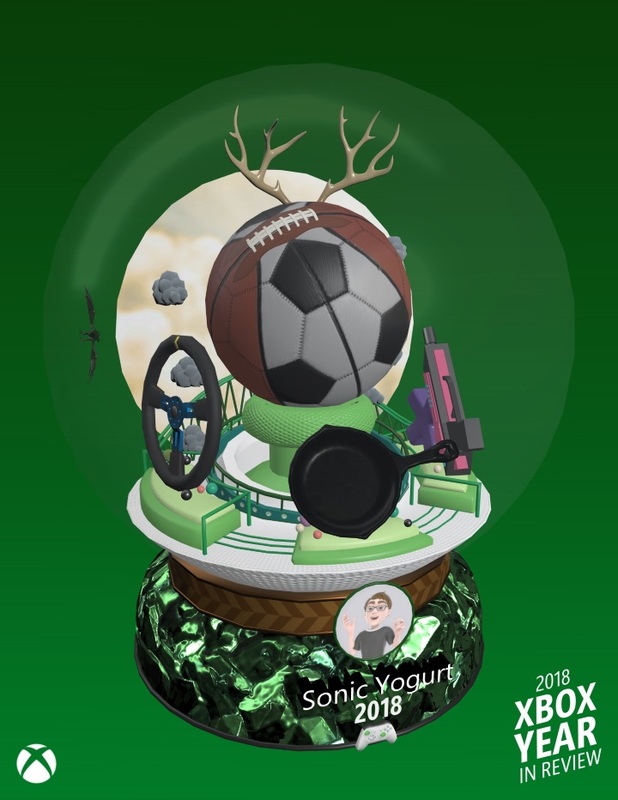 Xbox Year in Review! Only goes through October. Weirdly, it says my mood was "Proving your critics wrong through sports games", even though I didn't play any sports games at all in 2018. Apparently it's counting the Forza series as sports. The external is disconnecting. It could be the drive failing, or the Xbox not providing enough power to it if it's USB powered. If you have multiple USB ports in use, this may be causing the USB port to not provide as much power as it once did. In all fairness, my PS4 got a lot of playtime this year between God of War, Spider-Man, and Detroit. GWG for January. Hopefully no one went out and bought Celeste after it started to win some awards. Oh wow, Celeste is a big one. I have it on Switch but only a few hours in.